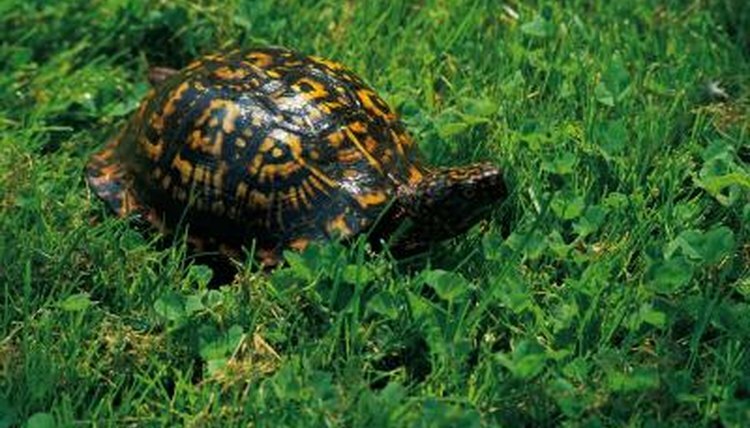 Land turtles, like the box turtle and tortoise, live their whole lives in the wild outdoors. Keeping a land turtle in an indoor enclosure for the entire year is unhealthy. An outdoor cage, on the other hand, offers the opportunity to give the turtle fresh air, fresh food and a healthy temperature gradient. By constructing an outdoor cage, you will ensure that your turtle remains happy and healthy for many years to come. Select an area of your yard with enough space to accommodate the enclosure that you will create. The enclosure must receive partial shade at all times and adequate sunshine for your turtle. Use the eastern side of your house, if possible, to eliminate the need for one of the wood or vinyl sides. Make sure the area is clear of any potential danger to your turtle. Strengthen or install fences to protect against neighborhood dogs. Install a netting top to the enclosure once finished if you have any doubt. Dig a footer or small trench to the depth and width of the bricks or paving stones you will be using in a 4-by-4-foot square. Sink a post into each corner and each 2-foot interval between the corners, using the sledge hammer to drive the posts in until you have 16 inches of post above ground level. Place the bricks into the ditch so that they come flush to the ground and as tight as possible to each post. Land turtles are notorious for digging their way to escape, and this will prevent them from being able to sneak underneath your siding material. Set the siding material up on top of the bricks, in front or behind the posts, and screw in place. Wood siding material should be made of weatherproof wood, at least 1 inch thick, that has not been treated with any potentially poisonous stains or polishes. Vinyl siding material should be thick enough to prevent any accidental damage. If using thin vinyl material, reinforce with additional PVC piping. Bury a flower pot saucer or other water dish in one side of the enclosure, so that the lip is level to the ground. The water dish must be shallow enough for your turtle to comfortably stand in. Many land turtles are not adept swimmers and care should be taken to prevent them from drowning. A larger water dish, such as a restaurant server’s tray, may be used for larger groups of turtles and larger enclosures. Partially bury a flower pot for each turtle, laying on its side, in the enclosure to serve as hides for the turtles. They should be able to crawl in and out when need be. Plant some turtle-safe, edible plants, such as strawberry plants, in the enclosure. They will serve as additional shade and a food source for the turtle. Till a small area using your spade or shovel, and use this area for grass shavings. Water this area heavily and it will attract worms, another land turtle food favorite. Place logs, small nonpoisonous ferns and other safe decorations in the enclosure for the turtle to climb on or dig under. Introduce your turtle to the habitat, cover with protective netting if necessary, and enjoy.  This enclosure is suitable for up to three adult North American box turtles. Larger turtles such as tortoises as well as large groups of turtles should be given much more ground space. The sides also must be higher than the turtle's entire height, should he stand on his hind legs and try to reach the top to climb over.  A similarly sized enclosure should be built indoors if you live in a region where winter temperatures are too cold for your turtle. ⚠ Consult a veterinarian or breeder about the climate requirements of any land turtle you will be caring for to prevent stress-related illness from improper humidity or temperature. What Kind of Wall Will Keep My Turtles in a Small Pond? What Size of Aquarium Do You Need for a Turtle?